As the weather warms up it’s time to get outdoors! Experience cinema under the stars in style. 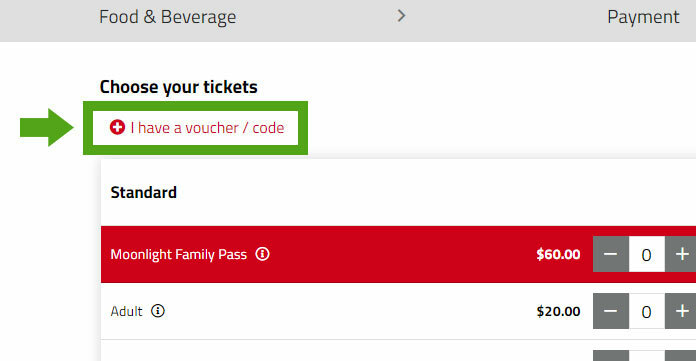 • Your Moonlight Cinema voucher code and 4 digit PIN number can be found within the Voucher Code field on your Groupon voucher. As Australia’s favourite open-air cinema, Moonlight Cinema screens advance previews as well as contemporary, cult and classic movies. Screenings are held at six locations across the country - Adelaide, Brisbane, Melbourne, Perth, Port Douglas and Sydney. Movie-goers who are hungry need not worry as an LA-style food truck serves up a delicious range of street food, snacks and beverages nightly.